Acer made a number of announcements during the [email protected] event. The biggest one was the refresh of its gaming portfolio which includes new laptops, desktop, monitor and accessories. Acer unveiled two new Predator Helios gaming notebooks including the Helios 700 and Helios 300. The former includes a unique HyperDrift keyboard that slides forward, allowing increased airflow directly through the top of the notebook. 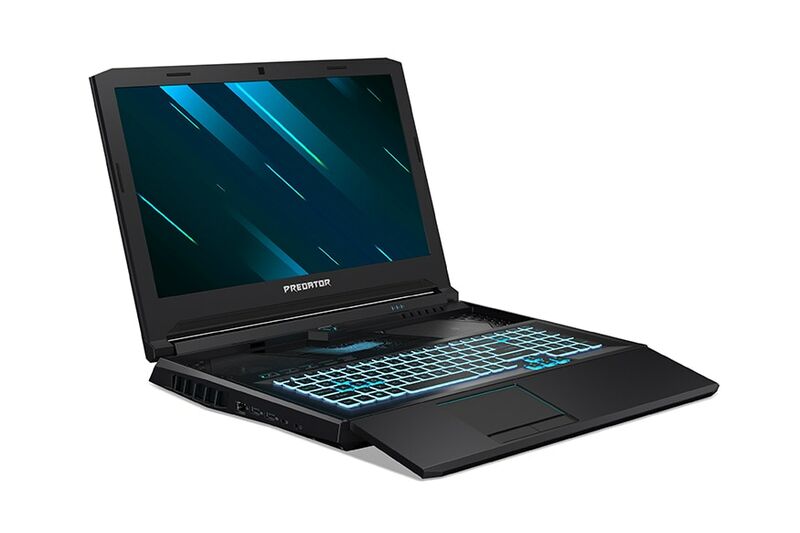 The redesigned Predator Helios 300 includes a sleek modern look and is powered by either up to an Nvidia GeForce RTX 2070 with Max-Q Design, or the latest GeForce GTX GPUs. The Acer Predator Helios 700 can be configured with the latest 9th Gen Intel Core i9 processor with Nvidia’s GeForce RTX 2080 or 2070 GPU, up to 64GB of DDR4 memory, and Killer DoubleShot Pro with Killer Wi-Fi 6 AX 1650 and E3000. There’s a 17-inch 144Hz FHD IPS display with 3ms response time and NVIDIA G-SYNC technology. Other features include a 5.1 speaker system and fourth generation AeroBlade 3D fans and vapour chamber for cooling. The Predator Helios 300 gaming notebook has been updated with a new design. This can be configured with 9th Gen Intel Core i7 processors along with Nvidia GeForce RTX 2070 GPU with Max-Q Design supported by a Turbo key for one-punch overclocking and Killer DoubleShot Pro. There is up to 32GB of DDR4 2666MHz memory and up to two PCIe NVMe SSDs in RAID 0 plus a hard drive. The Helios 300 will be offered in 15.6-inch or 17.3-inch Full HD IPS 144Hz displays with narrow border and 3ms overdrive response time. The Predator Helios 700 gaming notebooks will be available starting at $2,699 (Rs 1,87,000 approx). The Predator Helios 300 gaming notebooks will be available starting at $1,199 (Rs 83,000 approx). The Nitro 5 has been updated and is offered in 17.3-inch and 15.6-inch 1080p display options with an 80 percent screen-to-body ratio. This one also comes with the latest 9th Gen Intel Core processors, the latest Nvidia GPUs, two M.2 Gen 3 x4 PCIe SSDs using NVMe technology in RAID 01, and up to 32GB of DDR4 RAM. It also features Gigabit Wi-Fi 5 with 2×2 MU-MIMO technology and an array of ports such as HDMI 2.0, USB Type-C 3.2 Gen 1, and more. Both the Nitro 7 and Nitro 5 feature dual fans, plus Acer CoolBoost technology and a dual exhaust port for improved cooling. The notebooks also come with Waves MaxxAudio advanced sound optimization technologies. The Nitro 7 gaming notebooks will be available starting at $999 (Rs 70,000 approx) while the Nitro 5 gaming notebooks will be available starting at $799 (Rs 56,000 approx). The new Predator Orion 5000 desktop is aimed at high-end gamers featuring an overclockable octa-core 9th Gen Intel Core i9-9900K with support for dual-channel DDR4 configurations of up to 64GB. There is also the latest GeForce RTX 2080 GPU, a Cooler Master CPU Liquid Cooler and a custom shrouded power supply unit with a removable dust filter. The tower’s chassis comes with a reduced footprint, with a see-through side panel and a layer of metal mesh. Other notable features include 2.5Gbps Ethernet, two headset cradles, an Easy-Swap expansion bay with support for 2.5 inch form factor SATA I/II/III SSD and HDD drives and of course custom RGB lighting. The Predator Orion 5000 gaming desktop will be available starting at $1,199 (Rs 83,000 approx). Along with the desktop Acer also revealed its Predator LFGD (Large format gaming display) monitor measuring at 43-inches. The monitor comes with an ultra-high definition resolution (3840 x 2160), with a 144Hz refresh rate. The monitor’s AdaptiveSync feature adapts to the frame rate of the outputting device, and the VA display panel features a wide color gamut of 90 percent of the DCI-P3 color space. It is also DisplayHDR 1000 certified which should result in great contrast and color accuracy. The company has been generous with the ports as you three HDMI ports, a Type-C, and a DisplayPort. The Predator CG437K P gaming monitor will be available starting $1,299 (Rs 90,000 approx). Acer also announced companion accessories including the Predator M-Utility Backpack that can accomodate a 17-inch laptop. It comes with a plethora of pockets including a tripod holder, built-in luggage strap for traveling, adjustable straps, and air mesh back padding. The Predator Cestus 330 gaming mouse with 16,000 DPI tracking, seven programmable buttons, on-the-fly DPI switching and RGB backlighting. The Predator Aethon 300 gaming keyboard comes with Cherry switches (MX Blue), teal blue backlighting, and anti-ghosting on all keys. Lastly, the Predator Galea 311 foldable gaming headset which has precision-tuned 50mm drivers featuring Acer’s TrueHarmony, hard key mutable mic, foam ear cushions and a 3.5 mm headphone jack connector.